With its geographic advantage in China and in the world, Guangzhou's transportation system is now developing in many ways. 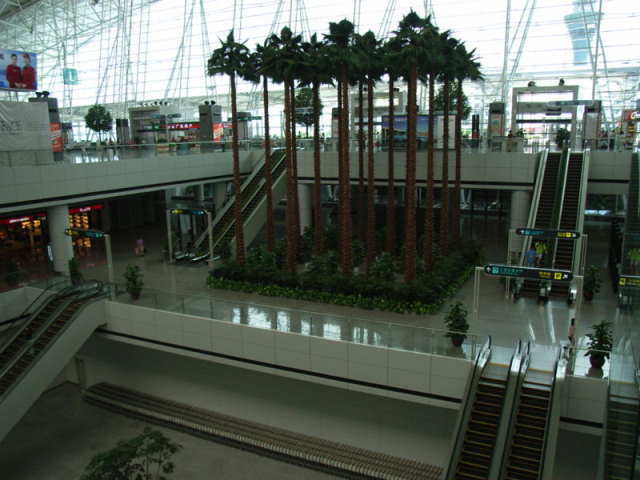 New Guangzhou Baiyun International Airport is a major hub in Southern China, second only to Hong Kong. The airport is the base of China Southern Airlines and has not only an extensive range of domestic flights, but some international connections, including Air France to Paris, China Southern to Los Angeles and Sydney, Thai Airways and Air Asia to Bangkok and Singapore Airlines to Singapore. Other direct international destinations include Amsterdam, Kuala Lumpur, Penang, Jakarta, Manila, Frankfurt, Tokyo, and Osaka. The airport is 28 km north from downtown Guangzhou. There are 9 Airport Express bus lines to take you to the downtown. There are also direct Airport Express buses to some cities in the vicinity, including Zhuhai and other cities in the Pearl River Delta. 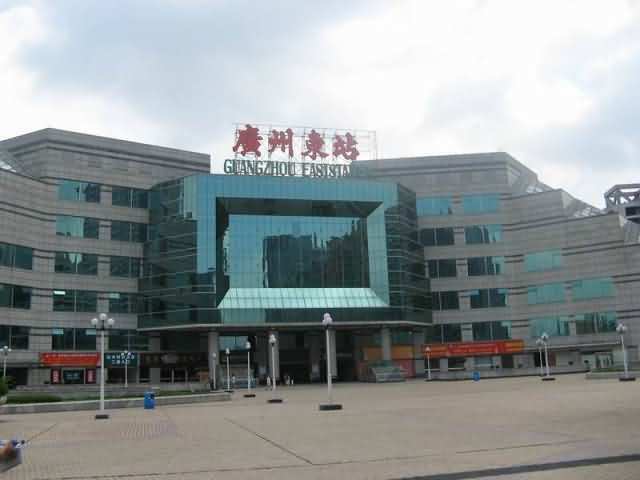 There are two major train stations in Guangzhou, Guangzhou East Railway Station and Guangzhou Railway Station. 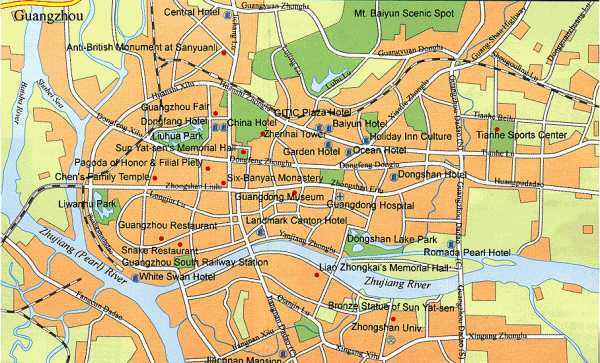 Guangzhou East Railway station services routes to Hong Kong, and other popular tourist destinations. 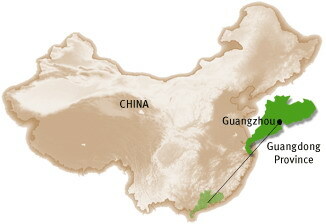 Trains cover the 182 kilometers from Hong Kong in about two hours (including a stop at Dongguan). Through Trains to Guangzhou depart from Hong Kong at Hung Hom railway station in Kowloon and arrive in Guangzhou at the East station. It is cheaper to take the high speed train (200 km/h) from Shenzhen to Guangzhou. Shenzhen is right across the border from Hong Kong and thousands of people walk over the bridge between the two every day. China High Speed train tickets can be bought from ticket counters or machines. 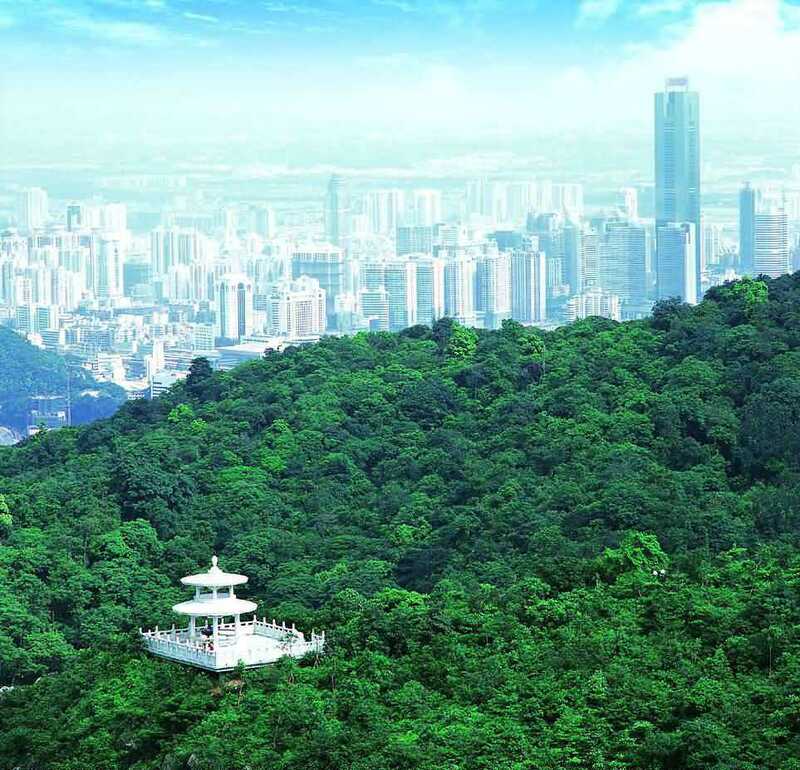 Bus services are available from Hong Kong International Airport to several locations in Guangzhou, stops at Jinan University on Huang Pu Da Dao, Garden Hotel and China Hotel. The trip takes about 3+ hours and costs 250 HKD. There are also cross border bus terminals throughout Hong Kong. Domestically, it is possible to hop on a bus from any corner of Guangdong province and get to Guangzhou. The main stations are the Provincial Station, Tianhe Dasha Station, Liuhua Station and Yuexiu Nan Station. There is a frequent ferry and hovercraft service from Hong Kong, Macau, and Haikou (Hainan Island) at the Zhoutouzui Ferry Pier. There are boats from other mainland cities, such as Xiamen, Shanghai, and Qingdao at the Dashatou Pier. New Nansha Pier is now open with 6 lines daily traveling between Hong Kong and Guangzhou. The trip takes 75 minutes (¥116-230). There is a bus route available from White Swan Hotel to Nansha, running three times a day. 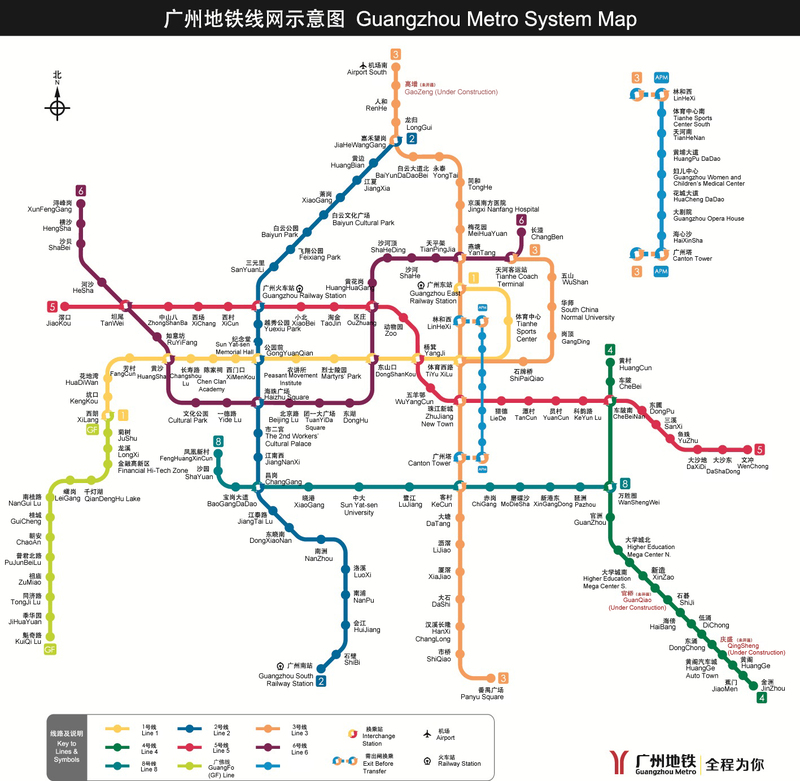 Guangzhou's metro system opened in 1999. There are 5 lines in the city. The network covers much of the city center and is growing rapidly outward. The fare ranges from ¥2 to ¥12. Most of the signs and announcements are also in English. Tickets are bought from vending machines in the stations. Bills from ¥5 - ¥10 or coins from ¥0.5 - ¥1 are accepted at ticket vending machines. You can change smaller bills at the customer service counter. Multi-Pass and Yang-Cheng-Tong are accepted and can be purchased at the customer service counter. 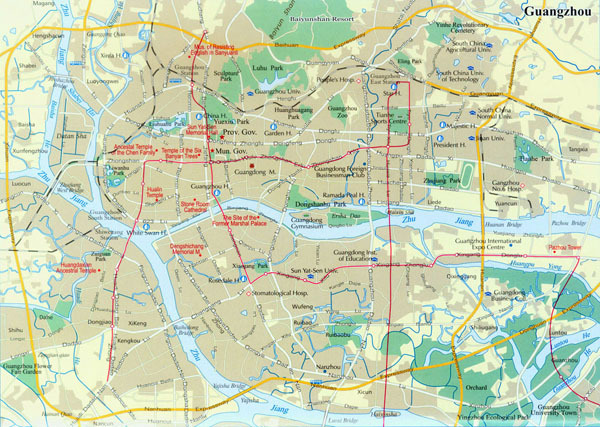 There is also a comprehensive public bus service that covers Guangzhou from end to end. By far, it is the cheapest way to move around. Bus fares are ¥1 for the older buses and ¥2 for the air-conditioned ones, although the older buses are slowly being retired. There are also 3 tourist bus lines, passing through many scenic spots in the city. Taxi charges CNY 10.00 for the first 2.5 km (1.55 mi) and CNY 2.60 per succeeding kilometer. The cost may be slightly different, depending on the taxi operators. ¥1 fuel surcharge is now added. The taxis are in different colours as they are belonging to different companies. Yellow, red and green ones are commonly to be seen in the streets.